Flaminio - Piazza del Popolo is an underground station on Line A of the Rome Metro, inaugurated in 1980. 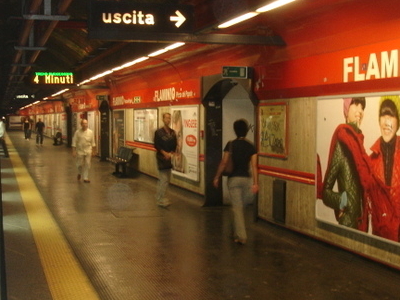 The station is situated on the large Piazza Flaminio, in the Flaminio quarter outside the Aurelian Walls, next to Piazza del Popolo, and is near the Campus Martius. A tram (line 2) connects the Piazza Flaminio to the Stadio Flaminio, the Auditorium at the Parco della Musica, the Palazzetto of the Sport and the Stadio Olimpico. The entrance hall of the station accommodates some mosaics of the Rome Artemetro Prize, created by Paul D' Orazio and Lee Doo Shik. Flaminio is also home to the Rome terminus of the Rome-Viterbo railway on which suburban services run to the Rome outskirts. Here's the our members favorite photos of "Metro Stations in Rome". Upload your photo of Flaminio - Piazza del Popolo!